Today my fiancée wanted to have McDonald's for lunch together so we could make use of the January coupons. Most of the vouchers are for snacks, but they do have some lunchtime discounts. We used two different ones for our lunch today, the 9 Piece McNugget & Coke , and the Double McSpicy + Coke, both were $5SGD ($4.08USD) each. Not the best value, when back in Korea, they have the coupon-less McLunch sets for 3000KRW ($2.85USD) which include fries! 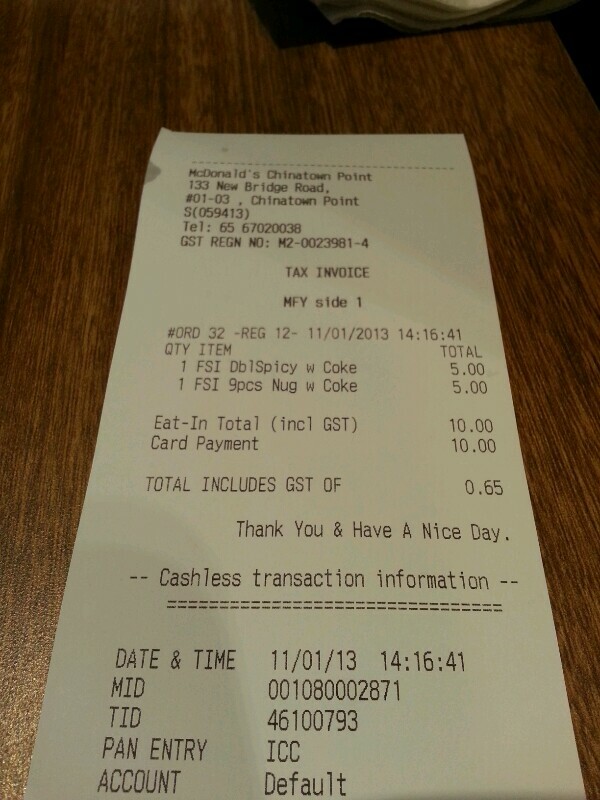 I've had a Double McSpicy once before, but I'll do a proper review of it this weekend, keep an eye out. The bright overhead lighting not doing my Mini any justice. The last time I can remember having McNuggets was when they were running the Kung Fu Panda dipping sauce promo back in Macau (and subsequently in HK), in 2011. Though the Curry Sauce is not a promotional item here in Singapore, it was a flavour I had never tried before, so I thought it was the best selection I could make. As you can see in the photos, the sauce was a deep brown. 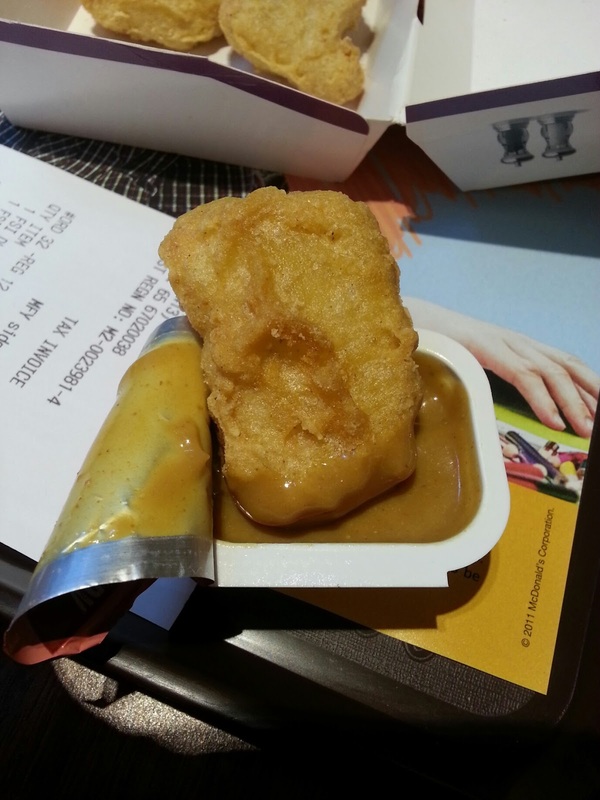 Because I'm not the biggest nugget fan, I expected the sauce to have the consistency of ketchup, or the chilli sauce you can get here in Singapore, but it was smoother softer, with more similarity to mayo than ketchup. It smelled like curry, and after I tried my first nugget, I laughed. She ask why I was laughing, but I couldn't explain it to her, so explaining it here is going to be even more difficult. I was expecting a little subtlety to the flavour, but it screamed CURRY! and that surprised me a little. 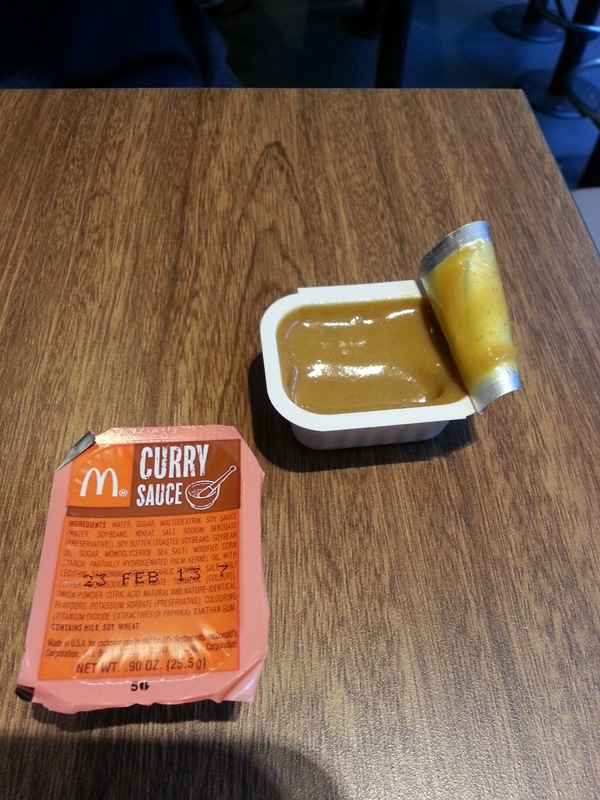 The sauce was like they took an off the rack curry powder, dumped in half the bottle, mixed it with a little water and packaged it up. It tasted nothing like REAL curry, but only like curry powder. 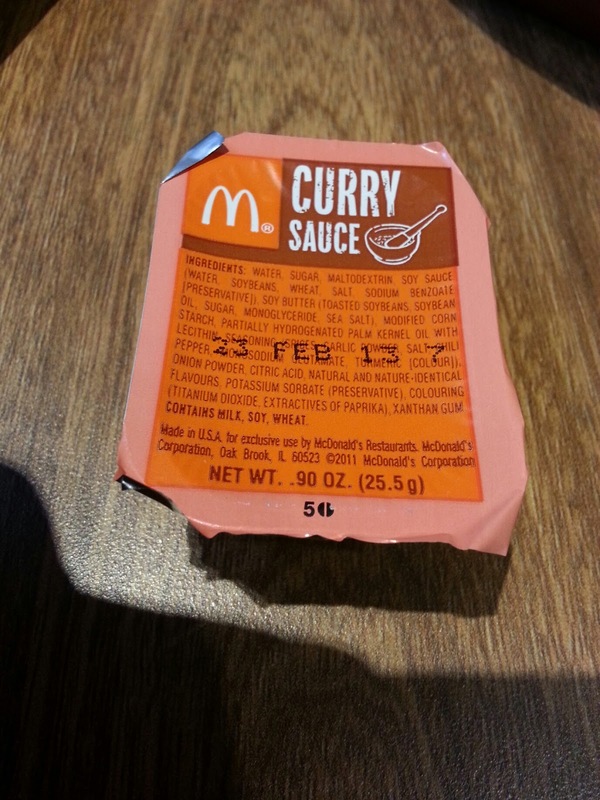 I guess it worked well enough, but the curryness of the sauce was overpowering enough that after we finished our 9 piece nuggets, we still had more than 3/4 of sauce left in the package. So here's where the contest comes in. 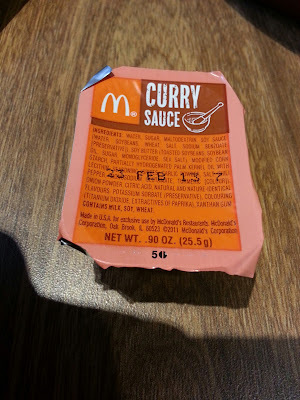 Since they gave us two packets of Curry sauce, I'll send the extra to any reader (who isn't in Singapore - where's the fun in that), completely free, I'll pay for the postage. Leave a comment below (make sure you are registered, or I can't contact you), or send a email to travellingmcds@gmail.com and I'll contact a winner on Monday 21 January for their address, and send it off to them for free. I am an Indian reader and enjoyed the review. May I put my name in the hat for the Curry sauce packet? Though I just noticed that the Cheese McShakers is 3 days past its "best before". So let me know if that bothers you and it will help decide who I send it too.